San Francisco Opera has opened a sleek new production of Jules Massenet’s Manon with colorful balloons, vivid costumes and elegantly conducted music. Perhaps a cautionary tale on the dangers of leaving naive and ethically ambiguous young women unchaperoned in the courtyard of an inn while traveling, the opera follows its greedy heroine from her escape from convent life into the arms of the ardent Chevalier des Grieux. And then through a high life of champagne, jewels, lovers and ennui until she dies in the arms of that same chevalier she abandoned in the second act. Ellie Dehn and Michael Fabbiano in San Francisco Opera’s luscious production of Massenet’s “Manon”. Photo by Cory Weaver/ San Francisco Opera. 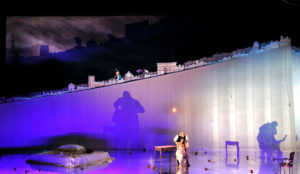 The production, which is unreservedly and unabashedly charming, takes place in front of a long sloping wall that divides the stage from wing to wing, designed by designer Vincent Lemaire. The floor and side walls are highly reflective, allowing for the most striking effects of the evening: lighting designer Gary Marder’s play of shadows across the long gracefully curved wall. This shadowplay was especially evocative during the intimate scenes of the opera, when Manon and Des Grieux are alone in their Parisian love nest and when Des Grieux faces his god and the shame of his unabated love for Manon after he has entered the seminary at Saint-Sulpice. At these key moments the multiple reflections of the singers on the wall gives us an uncanny sense of their emotions. A sense that we don’t always get from the characters throughout the opera. Soprano Ellie Dehn has the skills to present a complex vision of a complex character, with a voice that has both power and sweetness in the high notes and many nuances. But director Vincent Boussard and the production itself, which favors sweep and effervescence to the intimate and delicately uncertain, kept her performance in the realm of the flirtatious and superficial. We never sense that Manon is anything but seductive, a willing partner of gold and power, instinctively following a materialistic and licentious aristocracy. This narrowing of the role makes the opera’s ending less credible. Instead of believing in Manon’s love for Des Grieux and her remorse at the life she threw him over to pursue, the audience is itself seduced into a world of frivolous appetite. Ellie Dehn revels in the high life as Massenet’s “Manon”. Photo by Cory Weaver/ San Francisco Opera. Other symbolic hints in the production stumble as well, notably the beaded cage that drops down over Manon, a huge bell of beads that slowly descends at the Hotel de Transylvanie, signaling the intended conquest of Manon by the lustful aristocrat Guillot de Morfontaine. Tenor Michael Fabbiano was less restricted, and consequently more emotionally gripping in the role of Des Grieux. His singing never ceased to be convincing. The role of an ardent and, in a way, innocent lover suited him well. He offered the alternative of sincerity and purity of belief in contrast to the seductions of the opera. As did the conductor, Patrick Fournillier. The orchestra bloomed under his lead, Massenet’s adorable music grew lush at moments, strands of delicate figurations rising. The orchestra sounded simply great. The singers in the supporting roles were as vocally excellent as Dehn and Fabbiano. led by James Creswell as the Comte de Grieux, with his large and resonant bass presaging moral authority and impending doom. David Pershall showed wit and allure in the role of Lescaut, Manon’s cousin. Timothy Mix sang an eagerly calculating De Brétigny and tenor Robert Brubaker was a gently comic bad guy as Guillot de Morfontaine. Monica Dewey, Laura Krumm and Renée Rapier were the delightfully harmonious demi-mondaines with the beautiful jewelry, Pousette, Javotte, and Rosette. San Francisco Opera’s production of Manon continues through November 22. For tickets and information, visit sfopera.com.